Together with Preparing Future Physicists (PFP), FOSEP-CU is excited to co-host a panel with three AAAS Science & Technology Policy Fellowship alumni. The panel will take place in the Gamow Tower (11th Floor Commons) of the Duane Physics building on April 25th at 5 pm. This is a great opportunity for graduate students considering careers in science policy (and this program is not just for physicists – scientists from all fields are eligible). Read on to meet our impressive panelists! The panel will be followed by a reception with complimentary food and beverages, however you must RSVP to attend the reception. Please RSVP here. Ursula Rick is the program manager and a research scientist at Western Water Assessment where she is responsible for overall program administration and management, coordinating the research agenda and other outreach activities. She also conducts interdisciplinary, stakeholder-driven research for WWA on climate vulnerability and the adaptive capacity of municipalities, states and the West. Prior to joining WWA, Ursula managed regulatory policy for the oil and natural gas industry at Western Energy Alliance, and before that she was an AGI/AAAS Congressional Science Fellow in the office of former Senator Mark Udall, serving as an energy and natural resource policy aide on Capitol Hill. Ursula previously worked at CIRES as a post doctoral researcher at both the Earth Science and Observation Center, where she researched the seasonal timing of melt on the Greenland Ice Sheet, and the Center for Science and Technology Policy Research, where she focused on how the media presented the science and uncertainty of sea level rise. In 2008, Ursula completed her PhD on the hydrology of meltwater in large ice sheets at the Institute for Arctic and Alpine Research (INSTAAR) at the University of Colorado. She also has a MS in Engineering Sciences from Dartmouth College and a BS in Material Science & Metallurgical Engineering from Michigan Technological University. Dr. Jeremiah Duncan received his B.S. in Chemistry from the University of Missouri at Rolla (now the Missouri University of Science and Technology) and his M.A. and Ph.D. in Chemistry from Princeton University. His graduate research was in inorganic synthesis of iron-sulfur and iron-sulfur-nitrogen clusters as small molecule models of the nitrogenase enzyme. Prior to joining the Plymouth State University faculty, he served as a Peace Corps Volunteer in the Republic of Kiribati (pronounced Kee-Ree-Bahsh) in the central Pacific, where he taught science and math at a local teacher’s college; he was an Environmental Science Policy Fellow, sponsored by the American Association for the Advancement of Science and placed at the U.S. Environmental Protection Agency, where he worked on issues relating to the environmental applications and implications of nanotechnology; and he spent two years at the University of Wisconsin at Madison doing a post-doc on societal implications of nanotechnology and lecturing in Chemistry. Dr. Duncan teaches General, Inorganic, Instrumental, and Environmental Chemistries at Plymouth State University. His research interests are in the area of environmental implications and applications of nanomaterials. This semester, he is on sabbatical and working as a Visiting Researcher in the Dukovic Group in the Department of Chemistry, CU-Boulder. 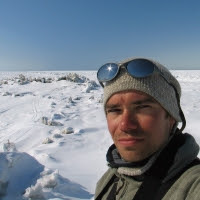 Dr. Matthew Druckenmiller earned his doctorate in 2011 from the University of Alaska Fairbanks where he combined geophysical monitoring with local knowledge to study how Iñupiat communities use and rely on a changing sea-ice environment. Matthew joined Rutgers University in summer 2015 to support the Sea Ice Action Team, however, is based at the National Snow and Ice Data Center (NSIDC) in Boulder, CO. Previously, Matthew was a PACE (Postdocs Advancing Climate Expertise) Fellow at NSIDC where he collaborated with Alaska’s North Slope Borough to investigate the impacts of Arctic sea ice loss on bowhead whales. With long-held interests in science policy, he has served as a Science Policy Fellow at the National Academies’ Polar Research Board (2005), a project manager at the Arctic Research Consortium of the U.S. (2006), and a AAAS Science Policy Fellow at the U.S. Agency for International Development (2013-2015). Originally from Trout Run, Pennsylvania, Matthew traces his appreciation for the Arctic back to his early years fishing small mountain streams with his father, grandfather, and brother. Next Editing policy to fit the genome?